Of course weather isn't climate (although climate is weather averaged over 30 years), so a cold summer doesn't mean anything. The following figure shows the San Diego maximum July-August temperatures for 1955-2009. 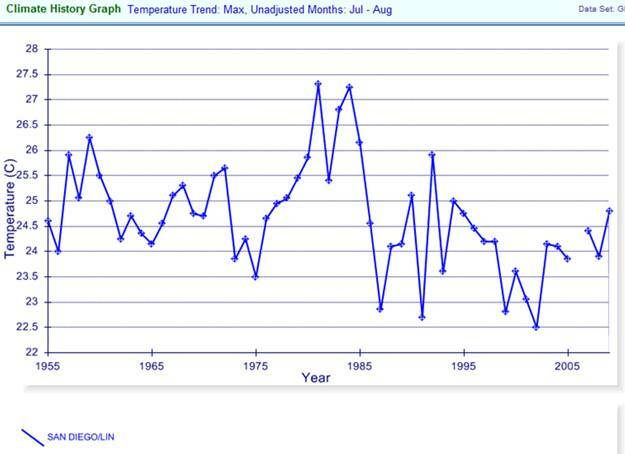 There is a cooling trend in summer temperatures in San Diego over the last 50 years. So this summer of 2010 is consistent with the trend. 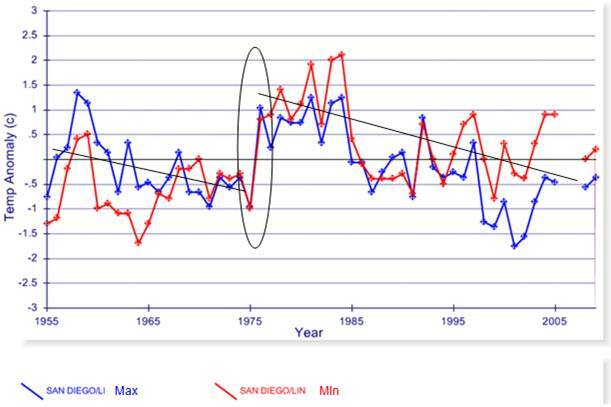 San Diego has been experiencing cooling for the last 50 years. The following figure shows the average annual temperature anomaly for San Diego from the NOAA GHCN database compared with the Hadley CRUTEM3 database for 1980-2009. 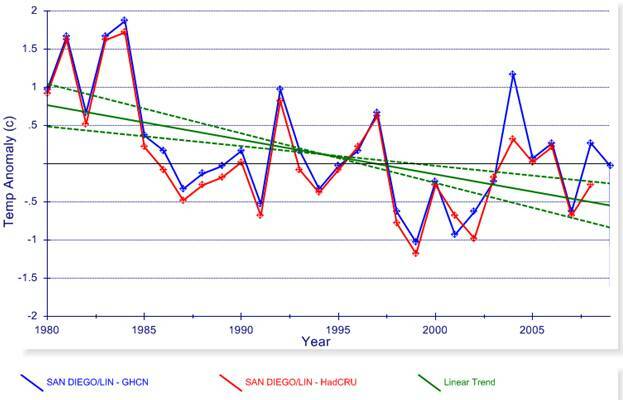 The linear trend is statistically significant - San Diego shows significant cooling over the last 30 years. The following figure shows the average annual temperature anomaly for San Diego from the NOAA GHCN database compared with the Hadley CRUTEM3 database for 1955-2009. There is no statistically significant warming or cooling trend. However, a significant warming event occurred in 1976 - this is the 1976 Pacific climate shift. The following figure shows the annual average maximum and minimum temperature for San Diego from the NOAA GHCN database for 1955 - 2009. 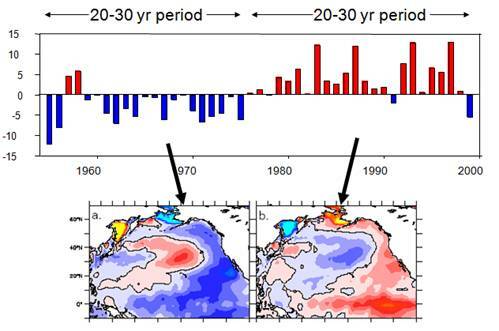 The effect of the 1976 Pacific climate shift is clearly observable - there are cooling trends before and after. The maximum temperature (blue) has been cooling more rapidly than the minimum temperature (red). 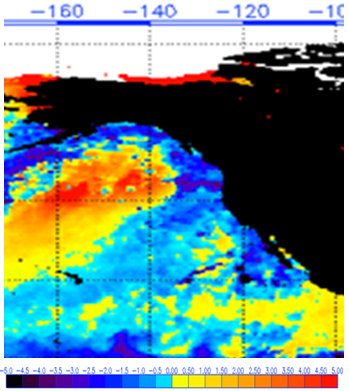 The Pacific coast of the United States is highly influenced by the Pacific Ocean temperatures and the Pacific Decadal Oscillation (PDO). The following figure shows the PDO [http://jisao.washington.edu/pdo/]. 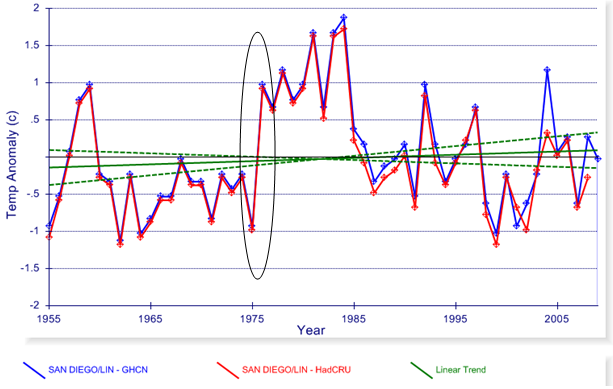 The following figure shows the GHCN and HadCRU annual average temperature anomaly for San Diego for 1955-2009 shown previously, changed to green and superimposed on the PDO. 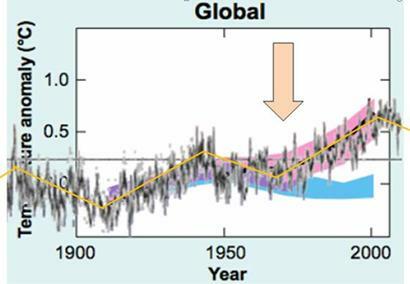 Atmospheric CO2 has been constantly increasing throughout this period. But that is irrelevant to temperatures.